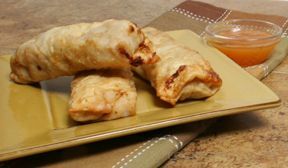 Perfect for an appetizer or a light lunch, these tasty egg rolls feature a chicken filling with a mild, slightly sweet flavor. Soak cellophane noodles in hot water for 10 minutes, drain. Add garlic and ginger and cook for 1 minute. 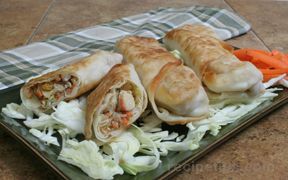 Add chicken, carrots, cabbage and teriyake sauce and cook for 5 minutes. Add the noodles and green onions, stir to combine. 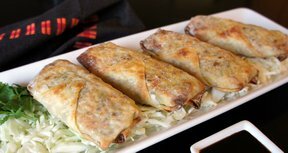 Take the egg roll wrapers one at a time and top with the chicken mixture down the center. Lay the wrapper with a point towards you, fill from point to point going across the wrapper. Roll up the bottom point over the top of the filling. 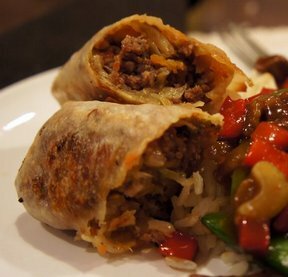 Fold in the sides and continue to wrap up to the other point. You can either steam them in the top of a steamer basket or fry them in 1 cup of canola oil until nicely browned, flip and brown the other side for approximatley 3-5 minutes each side. If you are going to steam them, lay lettuce leaves out to cover the bottom on the steamer so the rolls won't stick.